In general, the B.S.B.I. urges recorders to make lists within individual monads (see below for explanations on terms). However, tetrads are still very useful units for rationalising one’s day in the field. A good plan, having chosen (or been allocated) a tetrad, is to judge from the map, or from experience, or by viewing on the ground, which monad is likely to be the most productive in that tetrad (productivity being measured in terms of maximising one’s final count within the available time constraints). Perhaps the chosen monad promises to supply the largest range of habitats, for instance, but other factors such as accessibility, footpaths, open access land vs. private land when the owner is unknown, etc., also will play a part. A hectad is a 10km × 10km square of the Ordnance Survey National Grid. 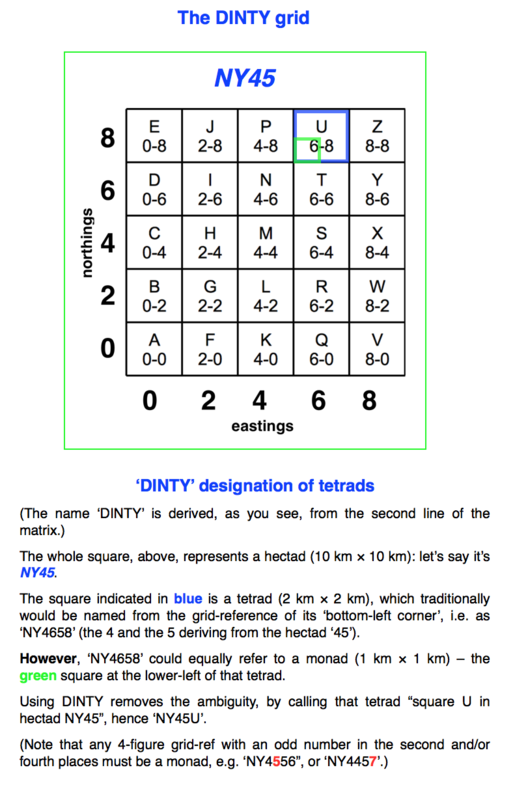 A tetrad is a 2km × 2km square of the Ordnance Survey National Grid. Tetrads are much-used recording units in field-botany and for other classes. A Flora of Cumbria uses tetrad dots on its distribution maps, as do many other similar works. 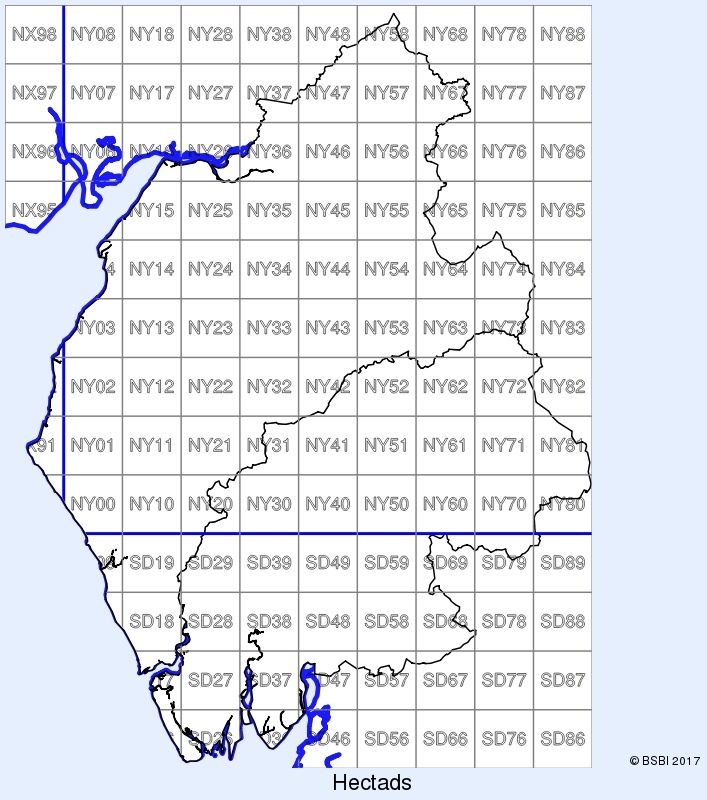 We previously designated a particular tetrad by means of the grid-reference of its south-west corner, so e.g. the blue tetrad in Hectad NY45, below, would be ‘NY4658’. However, this is ambigous, since ‘NY4658’ also refers to a monad, which is a 1km × 1km square, marked as a green square below. To avoid ambiguity, the ‘DINTY‘ designation is now used, and this is explained next (a downloadable image).